There are lots of new and exciting things happening at the Latte Lounge! Keep your eyes peeled for news and updates all next week! and show us all their crafty creations! Wow, week 4 already, can you believe it? This week we are asking to see your Christmas Themed projects plus Die Cuts or Punches plus add "snow" plus use non-traditional colors. Have fun. Stampin' With Brenda has generously offered a 3 month subscription to WOW. Let's be sure to visit them and give them some love. First we have this fun card from Stacie. Ok, now, remember this is a progressive challenge, so be sure to check back each week this month to see what new twist we've added. There will also be more prizes added. Yay. I can't wait to see what you all create. Good Afternoon Everyone! It's FRIDAY!!! It sure has been a long week! How has yours been? Okay, now for my creation... I am a bit late getting this posted, as I was a bit late getting it completed; but hey... better late than never right? LOL! 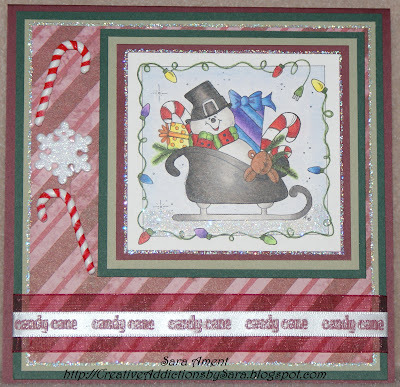 This creation was created for The Latte Lounge July Monthly Challenge; "Christmas In July"! Since this is for Week 3, the twist is for the creations to include... Christmas/Holiday Theme - Add Die Cuts or Punches - Add Snow (ex. Cotton, Flower Soft, Glitter, Puffy Paint, etc.) 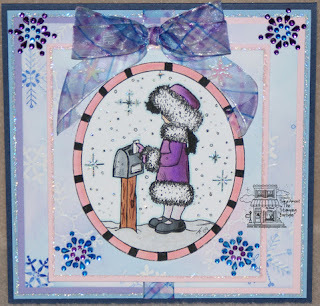 As you can see, I have used an image from The Stamping Boutique called "Sledding Snowman". As always thanks for stopping by, and if you get some time to create, we have plenty of room for you Holiday Creations! Welcome to week 3 of our July Monthly Challenge. Are we having fun with this? I know I am. So for week 3 we would like to see your Christmas Themed projects plus Die Cute or Punches plus add "snow". 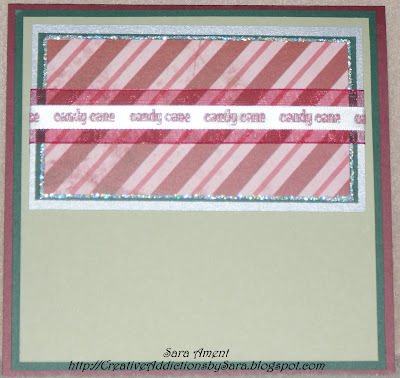 You can use fun flock, glitter, cotton, that glittery snow stuff you can buy in a jar, etc... Whatever you can think of. Have fun with it. Glitterbabe who has generously offered $10 to her store. Stitchy Bear Stamps has offered $10 to their store. Fresh Brewed Designs is offering 3 digis of your choice. First we have this fun card from Stacie using Chubby Snowman. Here is Jen's card also using Chubby Snowman, isn't he cute? And here is my creation using Reindeer. It's kind of hard to see, but I added some fun flock to the "snow" on the background. The second pic shows it better. Wow, what fabulous creations we had for our last months challenge. I'm guessing you'd like to know who the winners are, right? The In A Scrap Creations winner is Kelly S.
Congrats to all the winners. Please contact Stacie to find out how to claim your prizes. Now, I'll bet you're all just wondering what we have in store for you in July. so our theme is Christmas. We want to see all your Christmas themed creations. It's week 2 and time to add a new twist to our challenge. 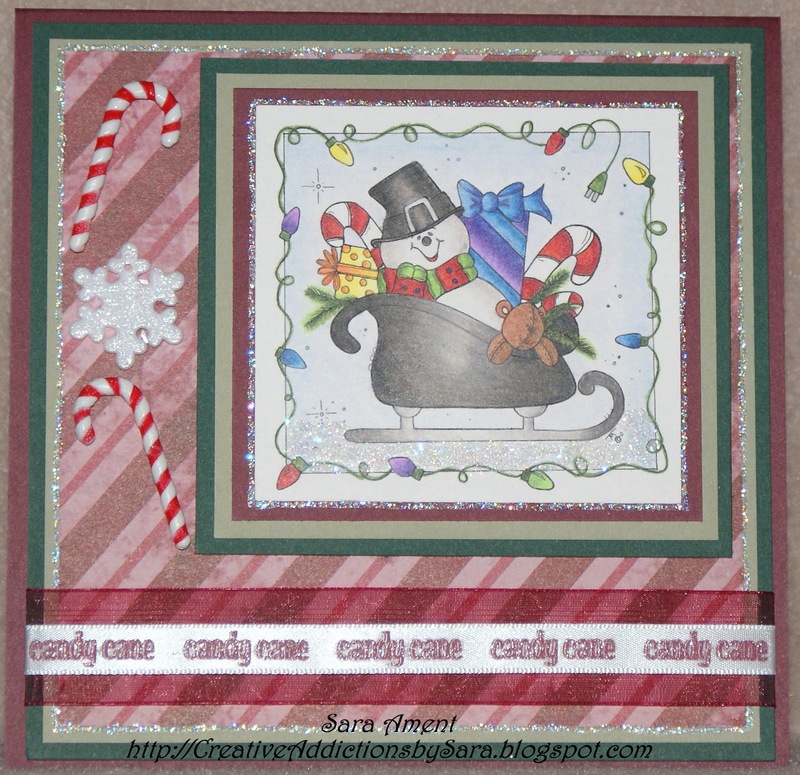 Christmas Themed projects and add Die Cuts or Punches. I can't wait to see all of your creations. The Stamping Boutique and the prize is 2 images of your choice. In A Scrap Creations Amanda has generously offered a $10 gift certificate to the store. JLJ Designs Jen has offered a digi/paper pack of your choice. First we have this lovely creation from Sara using Candle. Next we have this fun card from Stacie using Natalie. Here is Jen's card using Mail Girl. And here is my creation using Reindeer. to see what new twist we've added. There will also be more prizes added. Yay. Howdy Kiddos!Can you believe it's JULY already?We hope you all have funand got to see lots of fireworksfor the 4th of July! If your weather is yucky,we are ready for you to get crafty! Even tho it's no fun to be insideon summer breakit IS fun to make cardsand paper projects! We areDREAMING OF A SUNNY DAYand we can't wait to see yourSunny Day Projects! Miss Heather from Fresh Brewed Designsis going to sponsor our challenge this monthand she gave us FREEBIESfor you to use! On the count of three, everybody now:Thank you, Miss Heather! Grab this FREE imageand use it for a project!Post your project HERE for us to seeand we will send you ANOTHERFresh Brewed Freebieto make another project! There is only one rule to our challenge:HAVE FUN!! You can make any project and enter as many times as you like! This challenge will run for all of Julyso make sure you enter LOTS of times so you can get LOTS of freebies!! Good morning! Happy Independance day to those of you in the US. Are you ready for our July Monthly Challenge? This month we decided to get a little festive and chose Christmas for our theme. We want to see all your Christmas creations. 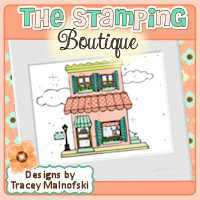 Our sponsor for this week is The Stamping Boutique. Here are some creations from our design team to inspire you. 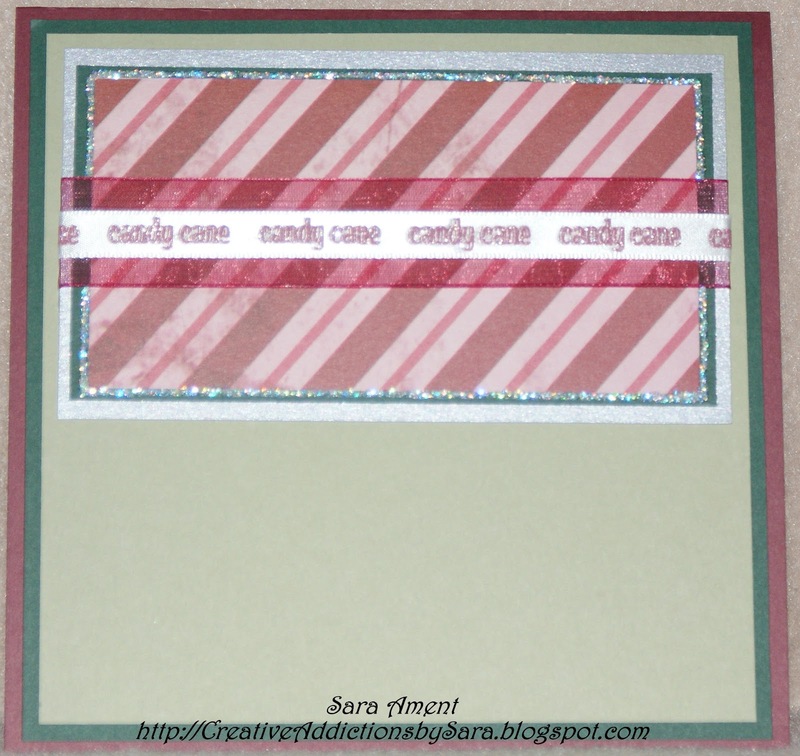 First we have this lovely card from Sara using Mail Girl. 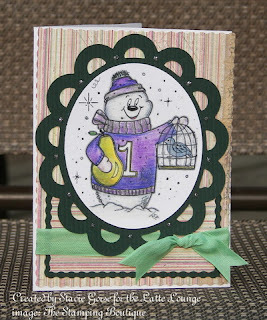 Here is Stacie's fun card using 1st Day of Christmas Snowman. And here is my card using Reindeer. Remember, this is a progressive challenge, so be sure to check back each week to see what the new twist will be.